Google is starting to support a number of microformats such as vCard and hReview. 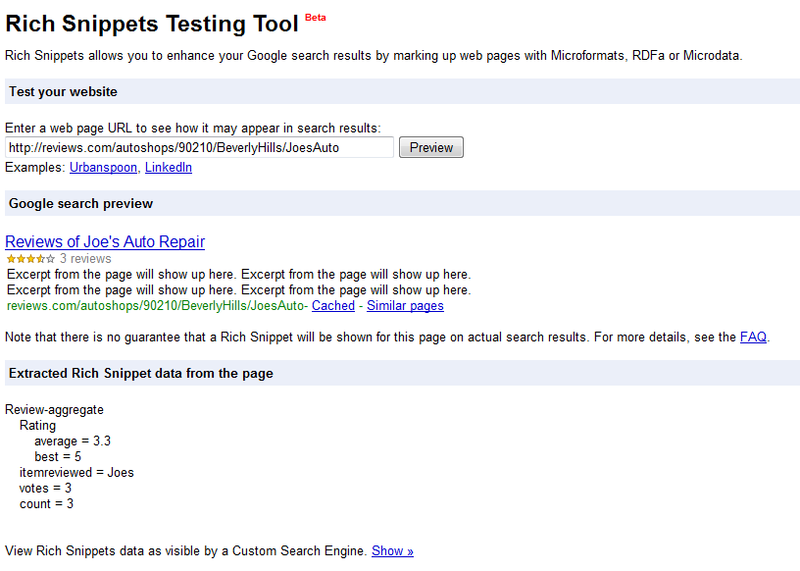 Google uses the term Rich Snippet for microformats. This article shows by example how to use the hReview-aggregate format, which is ideal for sites dealing with ratings and reviews. Some well known examples of sites already incorporating the hReview format are Imdb, Rotten Tomatoes and Cnet. As an example of how to use the hReview-aggregate format, we use a community driven site concerned with reviews of auto repair shops. On this site, each auto repair shop has a main page with its contact information and reviews written by users of the site. On each page we wish to put a hReview markup, so that search engines and other software agents can parse the name of the shop being reviewed, its average rating and the number of user reviews. The following PHP function writes a hreview-aggregate snippet based on a name of the auto repair shop and an array of reviews submitted by users. It first loops through the reviews in order to obtain an average rating (one decimal place) and then the actual snippet is echoed in the RDFa format. Chances are that the snippet is just summarizing what is already visible to the human eye on the page. To avoid this redundancy, it is perfectly legal to hide the snippet. This is what I have done in the example above by giving the div surrounding the snippet a “display: none” style. At the moment, Google only supports Rich Snippets in its search results from a handfuld of major sites such as Imdb, Rotten Tomatoes and Cnet. If you are curious to see how Google interprets the semantic data on your site, you can use the Rich Snippets Testing Tool. This tool also helps you in ensuring that your markup is syntactically correct. There is not much point in having semantic data on your page if it isn’t parsable by a machine after all :). Another useful, non-Google tool for this purpose is Optimus. Imagine that you have accumulated a database of customers, businesess or some other kind of organisation (from here on: “entries”). For each entry you have properties such as name, address and telephone number, but you are missing one essential thing: The URL for the homepage of the entry. You could fix this the hard way and begin looking up the homepage for every single entry, but this quickly becomes time consuming (and extremely boring). If the correctness of the link to the homepage is not mission critical, there is another, easier you could try: Google’s “I Feel Lucky” feature. Chances are, that the names of the entries are pretty unique. This means that a Google search on the name will most likely render the homepage for the entry at the top of the search results. This also means, that had you pressed the “I Feel Lucky” button, you would have been taken directly to this homepage. The good news is that you are not restricted to using this feature by clicking the actual button on Google.com. It is also possible to use it programatically by constructing a simple query string for the Google server. the btnI=3564& means that we want to use the “I Feel Lucky” feature and the string after q= is our search string, i.e. the name of our entry. 1: If the homepage of the entry in question is not ranked at the very top of the search results. 2: If the entry does not have a homepage at all, the user will be taken to a random page. However, if these drawbacks can be accepted, the method is definitely a time saver.